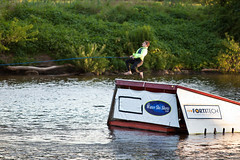 Summer is almost coming to an end but there is still time to grab some fun-nuggets close to home. A few days ago I checked the U.S. Water Ski Show Team in Scotia, NY with some friends. This all-volunteer, non-profit, family oriented organization has been around for the past 40 years. 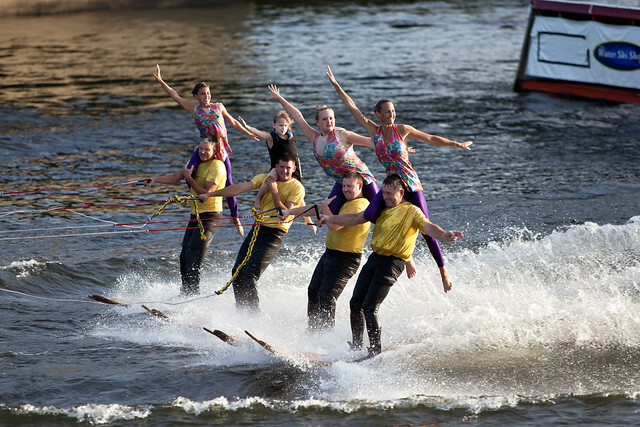 They are performing throughout the summer months at their home base along the Mohawk River waterfront behind the iconic Jumpin’ Jacks Drive-In. That’s a combo right there. 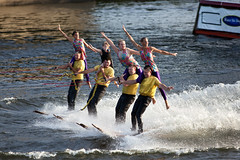 Bring a chair, grab a “Jack Burger” or a slushie, sit down and enjoy one of the free Tuesday water shows at sunset. I took a lot of photos that evening, the light was beautiful, the conditions perfect. I had not taken sport pictures in a while and my camera missed it, I can tell. I tried to keep a few consecutive action shots in this series, I recommend looking at the slideshow in chronological order, if you are so inclined. Am I bossing you around? More photos below. Click on any of the thumbnails to open a larger view, or check the full-screen Flickr slideshow if you have Flash installed. The show is about an hour long, cruising through a dozen entertaining acts. You can sit near the shore or stand in the back, there is no bad spot. 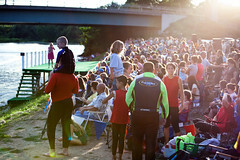 It was pretty packed that evening but there is room for a good crowd. The parking lot near Jumpin’ Jacks fills pretty fast though. I asked one of the organizers if I could get a bit closer to take pictures and they did their best to accommodate my clumsy 6’3”. I offered to send the photos later on, of course. This is definitely a family oriented team, you can feel everybody is involved. Children, parents, grand-parents, there is a healthy energy going on. The announcers are a bit cheesy but it’s all good, this fits the occasion and the location, in a nice way. Bring your iPod, you never know, maybe I was just super jolly that night. 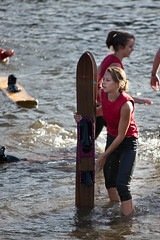 There are always looking for new volunteers by the way, you don’t even have to know how to ski. I would try if I had one ounce of balance in me. Picture the enormous splashes. 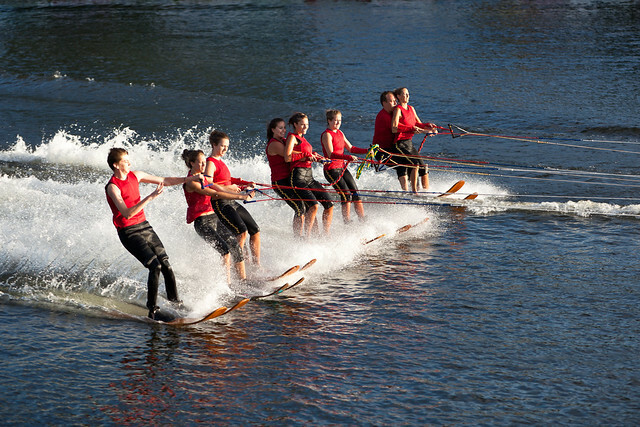 Show skiing involves many different water ski disciplines in one big aquatic Broadway musical. Unique to show skiing are, according to their web site, ballet/swivel skiing, adagio or strap doubles, freestyle jumping and human pyramids. And that’s on top of some good old barefooting and ski jumping moments. 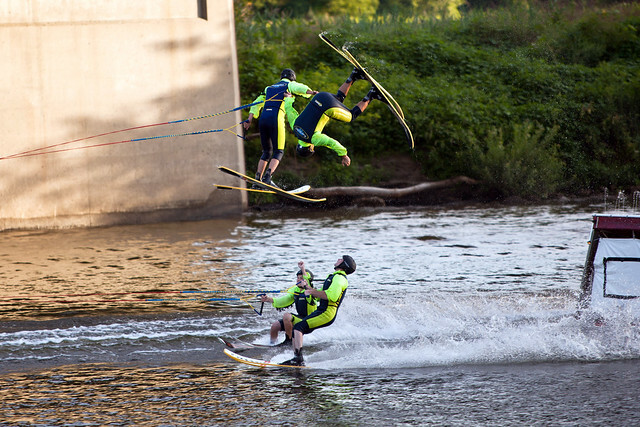 Barefooting was impressive. So fast! Huge wall of water. 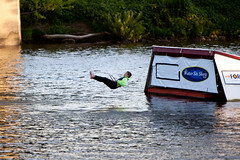 From uswaterskishowteam.com: barefooting has really evolved since […] 1947 […]. Advances in equipment and techniques have paved the way for new ways to “foot” . 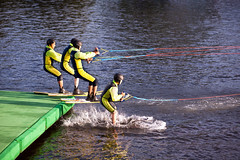 Typical ways to start barefooting are: to drop a single ski; to “deep-up” (start from deep water with no skis at all); a “double jump-out” (dropping 2 skis simultaneously at high speed); or even a “flyer” (jumping from an elevated starting point). Once they’ve mastered the basics, barefooters can advance to perform one-foot maneuvers, tumble turns, and even backwards barefoot and barefoot pyramids. 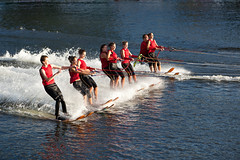 Swivel skiing. 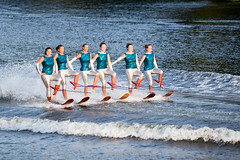 From uswaterskishowteam.com: swivel skiing combines ballet-like movements with difficult maneuvers. 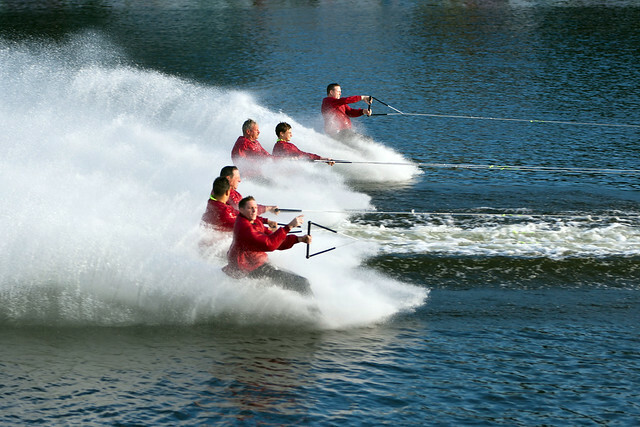 Mastering the swivel ski takes years. 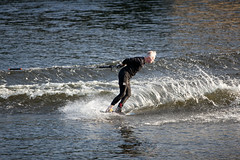 Using a wide, flat ski with a binding mounted on ball bearings enables the swivel skier to pivot 360 degrees. 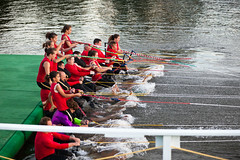 Their tow line uses a handle with a “bear trap” toehold allowing them to be towed by one foot. Strap doubles. 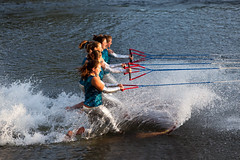 From uswaterskishowteam.com: Strap doubles combines the strength of a male skier with the movements of his female partner, who he lifts and turns during their routine. 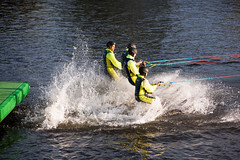 Because the male skier is towed by a rope attached to a harness, he has both arms free allowing routines filled with movements and lifts. Handle doubles. 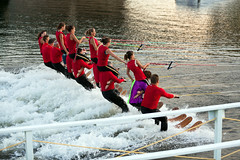 From uswaterskishowteam.com: handle doubles like strap doubles, involves a male skier basing a female skier on his shoulders. 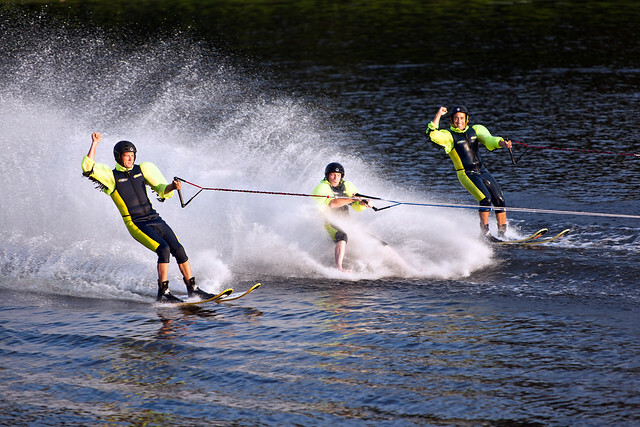 Unlike strap doubles, the male skier must hold the handle of a ski rope at all times while his female partner performs her moves. It is normally performed by multiple couples behind three or four boats simultaneously. Ski jumping. 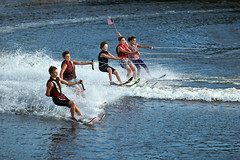 From uswaterskishowteam.com: ski jumping is performed on a surface that’s 14 ft. wide, 24 ft. long, and 5 ½ ft. high. Hitting the ramp at speeds from 30 to over 60 mph, they perform aerial feats like 360 degree (or helicopter) spins, distance jumps, front flips, and back gainers. 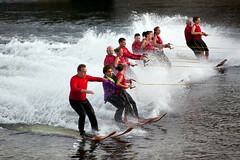 “Jump teams” often add to the excitement by having skiers cutting and weaving under the acrobatics taking place overhead. 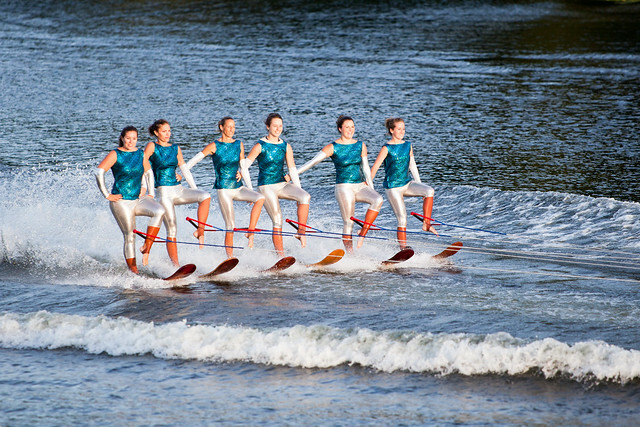 Ballet: From uswaterskishowteam.com: the ballet line consists of 10 or more girls skiing in unison, each skier on a single ski. Several tricks can be performed during the ballet like chorus line kicks, ankle holds, and toe holds. Pyramids! 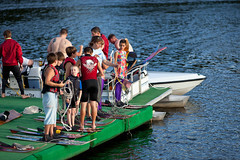 From uswaterskishowteam.com: to perform a pyramid, skiers must first start from a dock or in the water. After the tow boat reaches the correct speed, the pyramid starts taking shape as the second tier climbs across the bases and gets into position. Finally the top tier(s) climb into position and the pyramid is complete. Another variation is the pre-built or “hot” pyramid. 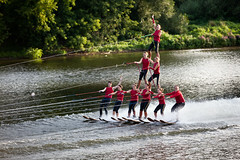 It is pre-built on the dock and goes from zero to skiing speed in the completed pyramid configuration. Planning for a large pyramid performed during the summer months actually starts during winter when the team begins practice at local gyms and pools. 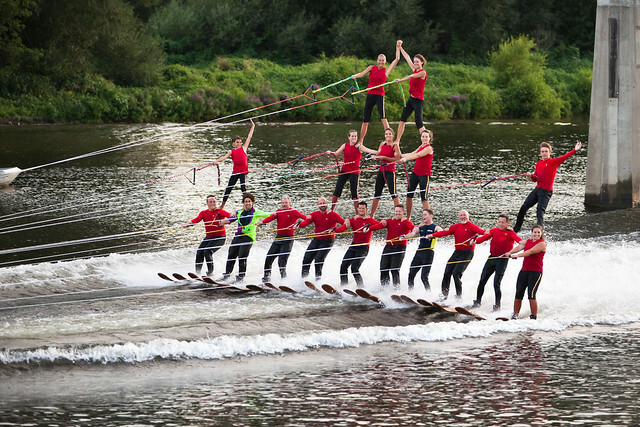 The pyramid symbolizes everything show skiing is about; teamwork, trust, and athletic ability. 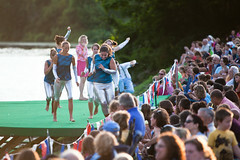 Check the slideshow for photos of the takeoff. 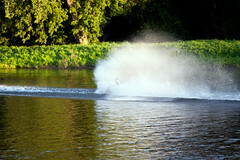 Visit the U.S. Water Ski Show Team events page for more information. 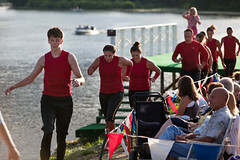 The team has two more shows this summer: August 24 and August 31. If you miss it this year, there is always next year, right? It’s a fun, relaxing way to spend your Tuesday night. You can always stroll the historic shoreline too; I love this part of Scotia. If Jumpin’ Jacks is not your style, take a short drive to Schenectady afterwards, park near Proctors and try a Nutella pizza at Aperitivo Bistro. That is one evil pizza for $10, I guarantee some interesting sensations in your mouth. This is where we ended our evening, and I don’t think I would have had it any other way. 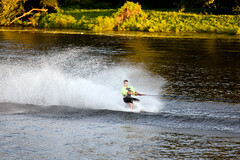 The team’s “home base” is located along the Mohawk River waterfront in Scotia, NY, behind Jumpin’ Jacks Drive-In and bordering Scotia’s Freedom Park and Collins Park. 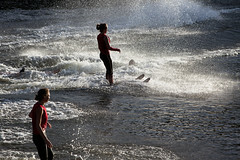 This entry was posted on Thursday, August 19th, 2010 at 10:01 pm and is filed under Sport. You can follow any responses to this entry through the RSS 2.0 feed. You can leave a response, or trackback from your own site.